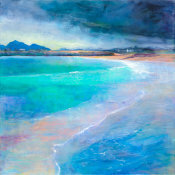 Lys is a contemporary Scottish artist living and painting in acrylics between Glasgow and Wester Ross. Her art conveys her pleasure and excitement in the scenery, light, weather and texture of Scotland. Accurate colour rendition of work cannot be guaranteed as every monitor will display differently.